Happy Independence Day to you. But beware of any 15 mile-wide spaceships hovering over downtown of your city! LOL! I certainly could use a technical article on methods of zipping up stubborn and hard-to-reach zipper tabs on my dresses and gowns. I think you posted an article containing some tips and makeshift "zipper helper" devices in the past. However, some of my dressier frocks and gowns have those pretty (but annoyingly useless) tiny tear-shape zipper tabs. I haven't figured out any device that works well on those. If you have nothing to do today (LOL), maybe you could do your first fashion technical writing on this topic. (Of course, I'm just kidding about you having to work on a holiday -- you do SO MUCH wonderful work for all your readers, that you deserve a day off). Thank You. Sheila, just Google "zipper helpers" and you'll find all kinds of items! 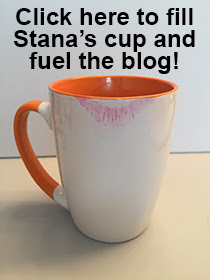 That's what I did after I forgot Stana's posting! lmao! Stana, I agree, it's too bad there aren't more of a demand for tech writers in the fashion world! Keep posting, I'll keep reading. Kudos to you.